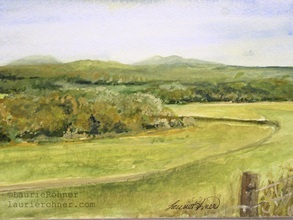 Scenic watercolor and oil paintings of woodlands mountains and trees by nature artist Laurie Rohner. 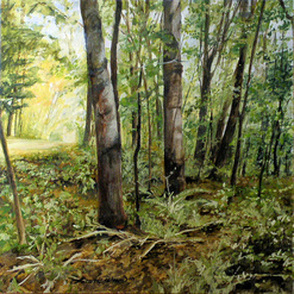 Shaded Woods - 12 x 12 inch cradled panel watercolor by Laurie Rohner. 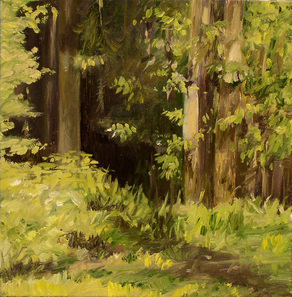 I have always been drawn to the serene tree landscapes and to the natural beauty in Vermont forests. I often wonder what stories trees could tell. Would it be kind or would we listen at all? Nature is a living beauty with a vast story and lessons to teach us. Nature can shelter us and nurture our souls or nature can devour us. I see nature as a place to rejuvenate and connect with Spirit. 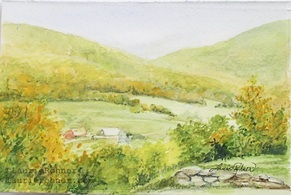 Some of my original landscapes you may be able to see a fairy or two. 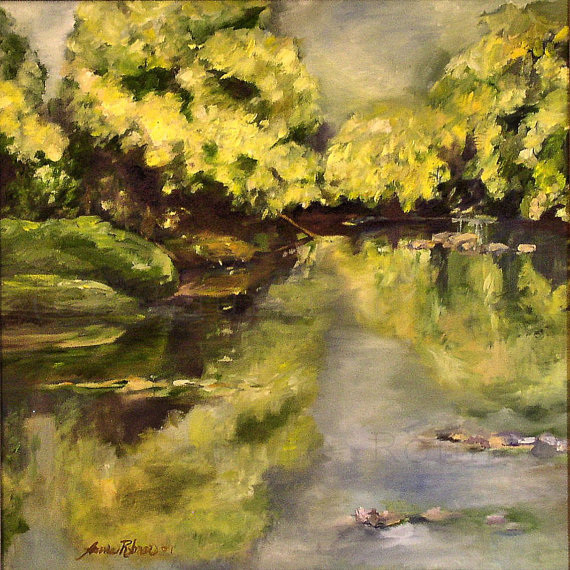 Mostly I hope my work will spark a connection back to nature for you to enjoy. 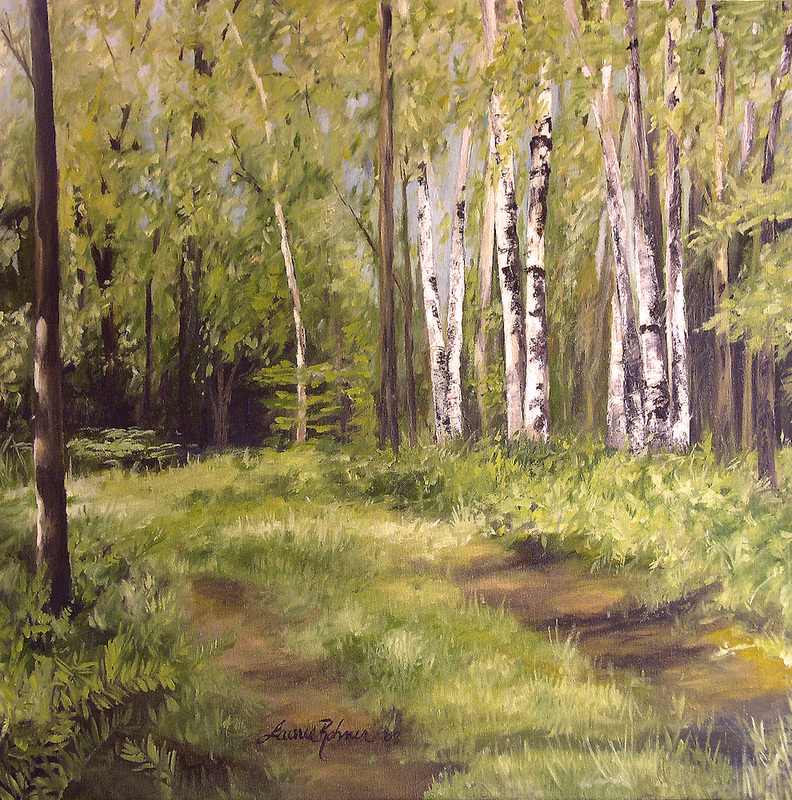 My nature paintings in oil or watercolor are mainly woodland forests filled with enchanted images of greens and browns with a hint of the sky coming through. 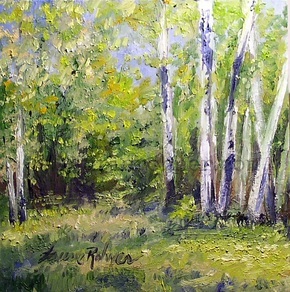 The oil paintings on canvas are serene enchanted forests, woodland Vermont dirt roads and inspiring botanical garden flowers. 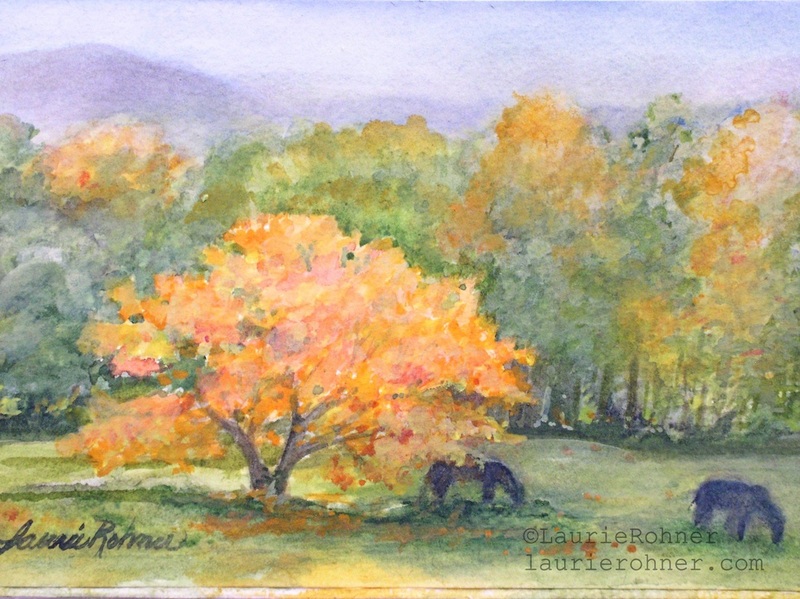 I use watercolor to also show the whimsy and fun of the enchanted magical world of my woodland trees. 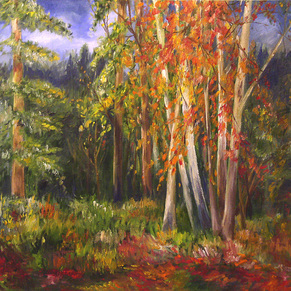 Many of my woodland forests are paintings that show you where the veil between fairies and this world is the thinnest. I always imagine a few fairies playing in the landscape. 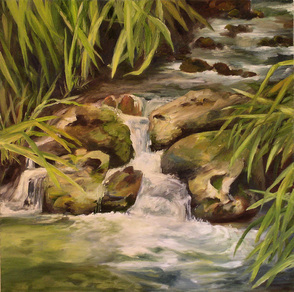 My oil paintings for sale are original canvas paintings of my connection with the natural world. Each canvas painting is ready to hang and the sides of the canvas are finished. 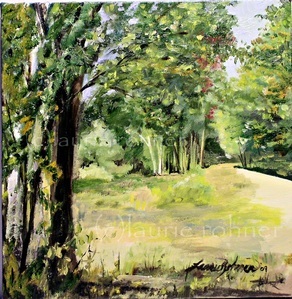 Recently I have started working on a Garden Series and am hopeful to have this series added shortly. Please check back if you are interested in seeing my new series. My original oil paintings are ready to hang and my watercolors should be framed with matte and glazing. 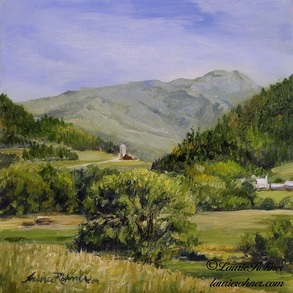 All work is signed and dated by the artist Laurie Rohner. All my work is original artwork and is created with my loving hand so I want you to be happy with any work you purchase. 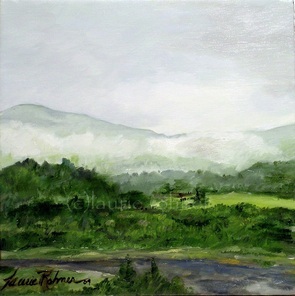 The paintings below have sold. Your painting is safely packed and shipped via Priority Mail. All prices include shipping to the USA only. Additional shipping charges will be applied to International Orders. Buy in my shop here!